Most modern cars these days come with Bluetooth, but cars these days can also last for 10, even 15 years before they start to become more trouble than their worth. But if you’re still driving an older model that doesn’t come with Bluetooth, you’re in luck. 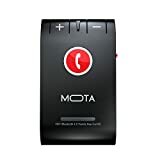 Amazon has a nice little sale going right now on the MOTA HD+ Bluetooth 4.0 Handsfree Car Kit, which will work in any car and is compatible with every smartphone on the planet.